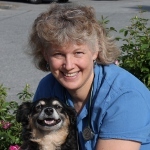 Dr. Ontiveros completed her undergraduate work at the University of California at Berkeley and received her degree in Veterinary Medicine from the University of California at Davis in 2001. Before coming to Sunnymead Animal Hospital, Dr. Ontiveros practiced in Yuba City, CA where she was known for her sympathetic manner and passion for the care of her patients. Dr. Ontiveros brings with her a special interest in ultrasonography and dermatology. She sees dogs, cats and "pocket pets" such as rabbits, guinea pigs and ferrets. When not at the clinic, Dr. Ontiveros likes to spend time with her two children, Nicholas (17) and Sammy (11). She also enjoys camping, reading, sewing and watching old movies with her husband, Mark.